One of the largest forest fires in northeastern Ontario, Parry Sound 33, continues to get closer to a segment of the Trans-Canada Highway despite hundreds of firefighters working to stop it from spreading. Officials with the province’s Ministry of Natural Resources and Forestry said Monday that the Parry Sound 33 fire had been expanding to the northeast and now comprised more than 8,200 hectares of land. “We have seen some growth on Parry Sound 33,” ministry spokesperson Shayne McCool told CTV’s Your Morning. 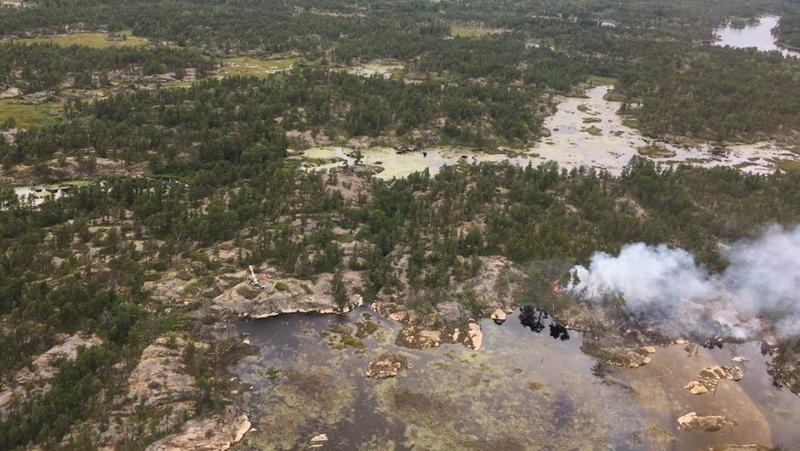 The Parry Sound 33 fire was ignited July 18 near the community of Henvey Inlet, Ont., which is located approximately 100 kilometres south of Sudbury. Flames from Parry Sound 33 were said to be six kilometres from the Highway 69 portion of the Trans-Canada Highway as of Monday evening. Two fires were extinguished in the northeast on Sunday, McCool said, but two others were discovered. Both of the new fires were less than half a hectare in size. While the cause of Parry Sound 33 has not been determined, the vast majority of Ontario’s forest fires are believed to have been caused by lightning striking forests after lengthy periods without significant rainfall. “Dry conditions in the forested areas have caused those fires to be ignited fairly easily,” McCool said. Grundy Lake Provincial Park, which sits on the east side of the highway, was evacuated over the weekend due to concerns about the fire’s growth. Approximately 800 campers were told to leave the park. Several other provincial parks have been declared temporarily off-limits due to forest fires, as has the French River. More than 556 firefighters from across Canada, the U.S. and Mexico are working to control and extinguish the fires. McCool said more than 300 firefighters and support staff from Mexico were taking part in the firefighting effort. More firefighters and equipment are expected to arrive in the province this week. Officials in Alberta have said one firefighter from that province died while battling a fire near Red Lake, in northwestern Ontario. Nearly 100 fires were burning in the province’s northwest as of Monday morning.